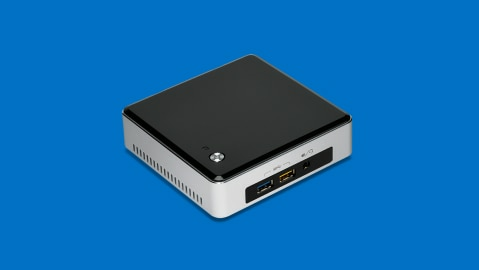 A revolution in ultra-compact device design, the Intel NUC NUC5i5RYK1 packs more features into 4 inches square. The NUC5i5RYK is equipped with the 5th generation Intel Core i5-5250U processor with Intel Turbo Boost Technology 2.02 which gives you extra GHz on demand to let you maximize performance on processor-intensive tasks like media editing. A replaceable lid gives you plenty of options to create the NUC you want—with amazing style and features. It also features Intel HD Graphics 6000 with 4K display capabilities to provide visually stunning graphics. A high-speed USB 3.0 charging port lets you easily charge your tablet or smartphone quickly. Complete with WiFi 802.11ac wireless, Bluetooth*, and 7.1 surround sound, the Intel NUC NUC5i5RYK is ideal for home theater PCs, media server PCs, and home hubs. For peace of mind, you’ll get embedded security that helps keep threats out and user identities and credentials safe. With this kind of power, size, and versatility, you’ll rethink what’s possible. To Recieve updates and possible rewards for Intel NUC Kit NUC5i5RYK please sign in. To Recieve updates and possible rewards for Desktop & Mini PC please sign in.